THE EUROPEAN COURT of Justice has ruled that web hosting companies and services cannot be ordered to install filtering software monitoring uploaded content for potential copyright infringement. In a ruling handed down this morning, the court ruled that any obligation to install filtering software for content uploaded by users would threaten the balance between the ability or rights holders to protect their copyright, and the right to entrepreneurship. “That injunction could potentially undermine freedom of information, since that system might not distinguish adequately between unlawful content and lawful content, with the result that its introduction could lead to the blocking of lawful communications,” the Luxembourg-court said. Any national court which allowed an injunction enforcing such filters, the court added, “would not be respecting the requirement that a fair balance be struck between the right to intellectual property, on the one hand, and the freedom to conduct business, the right to protection of personal data and the freedom to receive or impart information, on the other”. The court had been asked to rule on the case by the District Court of First Instance in Brussels, which had asked whether EU directives authorised a court to order web hosts to impose a copyright filtering system. 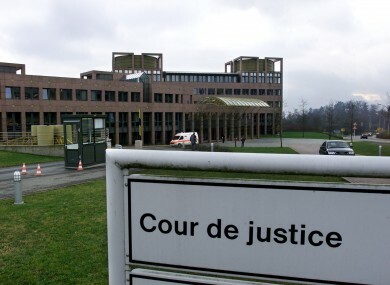 The original Belgian case had been brought by the music rights group SABAM, which had previously been on the receiving end of another major ECJ ruling, against the Belgian-based music sharing social network Netlog. In that case, known as the ‘Scarlet ruling’, the group was told it could not ask ISPs to issue blanket bans on file-sharing. TJ McIntyre of the Digital Rights Ireland group said the ruling was “not that exciting in its own right”, describing the ruling today as a “copy and paste” of the Scarlet ruling. “Maybe it’s significant in that they’re applying the same criteria to uploaded content as network traffic,” he remarked, saying the court could potentially have decided that hosting content meant a greater liability than an internet service provider which was merely carrying the traffic from a host to a user. The ruling comes as junior research minister Seán Sherlock prepares controversial secondary legislation which will allow copyright holders to seek injunctions blocking access to certain websites. Email “ECJ says web hosts can't be forced to install anti-copyright filters”. Feedback on “ECJ says web hosts can't be forced to install anti-copyright filters”.